The third colloquia in Fundamental and Translational Pediatric Oncology will take place in Bordeaux the 12 and 13 december 2019 at the Pôle Juridique et Judiciaire of Bordeaux University, in Pey Berland place, center of the city. The MiRCaDe team is organizing this colloquia. Pancreatic Cancer Symposium in Toulouse the 23 & 24 October 2019. Following the first meeting of Marseille in 2015, it offer a novel opportunity for international clinicians and researchers focused on pancreatic cancer research to both review recent advances and present their results. 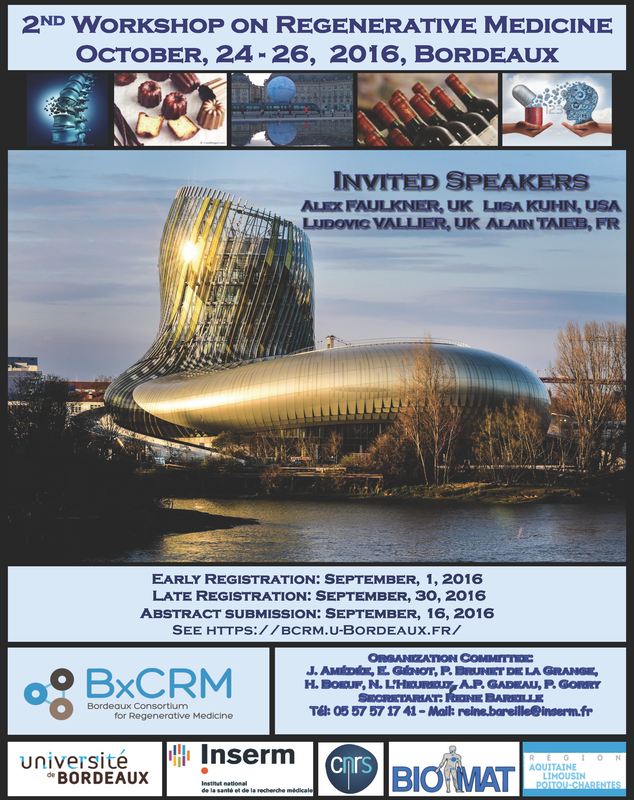 This symposium is organized by the AFRCP (French Association for Pancreatic Cancer Research). Sandrien Dabernat, PU-PH, biotherapy team is in the national organazing committee. The first international conference on Discoidin Domain Receptor biology will take place at the University of Bordeaux, Pey Berland campus the 22-24 may. The first ISAD Global workshop devoted to AD in sub-Saharan Africa (SSA) was held in Geneva with 30 participants including those from 17 SSA countries, representatives of the International Dermatology Foundation (a branch of the International League of Dermatological Societies) and of the World Health Organization (WHO), specialists in telemedicine and artificial intelligence as well as specialists in therapeutic patient education (TPE). AD is the most prevalent chronic inflammatory skin disease in SSA and needs a closer attention besides neglected tropical diseases (NTDs) with a dermatological presentation. A roadmad had been defined with top priorities such as access to essential medicines and devices for AD care, in particular emollients, better education of primary health care workers for adequate triage (e.g. better documents for AD on black skin), involvement of traditional healers… In addition several initiatives concerning AD research in SSA have been discussed and should be implemented in close collaboration with WHO in the next months and assessed at follow-up meetings, in particular at the next Seoul ISAD and Nairobi ASDV, both in 2020. CRISPR-Cas9 molecular scissors: a bit too sharp? New article by the Biotherapy team published in Nature Communications. In our research team, we are mainly interested by “molecular programming” with the aim to explore or manipulate complex biological systems such as living cells or organisms. In other words, we design molecules that have built into their structure a chemical program enabling them to perform specific tasks autonomously within biological environments. Recently, we developed various molecular devices programmed for the selective delivery of anticancer drugs. These functional systems were designed to allow: (1) the transport in the body of potent anticancer agents in an innocuous manner toward safe tissues, (2) the efficient recognition of malignant specificities located either at the surface of cancer cells or in the tumor microenvironment and (3) the controlled release of the parent drug exclusively at the tumor site. The therapeutic efficacies of these novel drug delivery systems have been evaluated for the treatment of various solid tumors in mice. Main results obtained in the course of this research program will be presented. Today the atmosphere has about 21% oxygen. Earth scientists now tell us, however, that the rise of oxygen was a very late event in evolution, something that occurred in the last 600 million or even the last 450 million years, since the origin of land plants. Life on land is dominated by eukaryotes, land plants and of course land animals. Before life on land, life was confined to aquatic environments. But eukaryotes have a fossil record that extends back more than 1.5 billion years. The majority of eukaryote evolution took place in anaerobic environments. Thus it is should not be surprising to see that the traces of our anaerobic past preserved in diverse eukaryotic lineages. Part of the talk will be devoted to looking at the remnants of our anaerobic past as preserved in modern metabolis, both in anaerobes and in aerobes. A puzzling aspect of oxygen in Earth history is this: Cyanobacteria started making molecular oxygen about 2.5 billion years ago, but why did it take so long for oxygen to accumulate in the atmosphere? There are a number of very complicated proposals in the literature. Perhaps the reason is very simple, though, and we will consider such a suggestion (nitrogenase inhibition). Perhaps the reason is simple enough that everyone (nonspecialists) can discuss it. La pemphigoïde bulleuse (PB) est la plus fréquente des dermatoses bulleuses auto-immunes. Elle touche avec prédilection le sujet âgé et se caractérise cliniquement par des bulles cutanées sur base inflammatoire. Son pronostic est médiocre (mortalité>20% à 12 mois), malgré les progrès thérapeutiques basés sur une dermocorticothérapie forte (DCF), qui est désormais le traitement de référence de la PB quelle que soit sa sévérité. De même, le nombre de patients qui rechutent durant la 1ere année de suivi reste élevé (environ 30%). Des progrès majeurs ont été réalisés ces dernières décennies sur le diagnostic immuno-pathologique et la compréhension des mécanismes physiopathologiques liés à la PB. Le rôle pathogène des anticorps anti-PB180 est désormais bien établi chez l’homme. Des modèles murins ont permis de reproduire la maladie et d’élucider le rôle pathologique des auto-anticorps comme inducteurs de la réaction inflammatoire qui est à l’origine de la formation de la bulle. Toutefois la transposition des résultats murins vers l’homme présente de nombreuses limites et ne permet pas d’expliquer pourquoi certains patients développent cette maladie et d’autres pas. De même, les questions restent sur les facteurs influençant la rechute, ainsi que ceux influençant la variabilité dans la présentation clinique au moment du diagnostic. Depuis plusieurs années, nos travaux se concentrent sur l’étude de ces variabilités interindividuelles, et l’utilisation de modèles ex vivo a permis d’améliorer non seulement nos connaissances sur les mécanismes physiopathologiques de cette maladie au moment du diagnostic mais aussi sur les facteurs de risque de rechute, le but ultime étant toujours d’apporter de nouvelles options thérapeutiques pour ces patients fragiles. The 26 November 2018 from 11:00 to 12:00. Gene regulation is traditionally assessed by molecular assays, probing the physical interaction between regulators and their targets (transcription factors with promoters, RNA-binding proteins with mRNAs, …). The advent of high-throughput techniques now allows a sensitive detection of molecular interactors for the regulators of interest – and these experiments usually identify hundreds or thousands of targets per regulator. This is particularly true for microRNAs (“miRNAs”), which are therefore believed to control most coding genes in mammals. Functional importance of these interactions is apparently confirmed by comparative genomics, which suggests that many miRNA binding sites are conserved in evolution. Yet several observations suggest that miRNAs do not have such a broad biological effect; in particular, miRNA-guided repression is surprisingly small (targets are usually repressed less than 2-fold, and gene activity is typically insensitive to such small changes in gene expression). We thus decided to revisit the biological relevance of miRNA/target interactions, and our results are indeed inconsistent with the notion that miRNAs regulate functionally so many genes. It appears that molecular biology techniques, as well as computational predictions, tend to over-estimate broadly the miRNA target pool, and just a subset of the identified targets are really, functionally targeted. Other regulatory events appear to be buffered by homeostasis, and they are inconsequential at the macroscopic scale. These notions are generalizable to every type of gene regulator, and they could promote a profound redefinition of “gene regulation”. in the University of Poitiers. During the 50st Congress of the International Society of Pediatric Oncology (SIOP) in November 2018, in Kyoto, Japan, Dr Christophe Grosset, who heads the MiRCaDe team, received a poster award at the “Solid and CNS Tumours: Clinical” Session. At this occasion, Dr Christophe Grosset presented his last results about the transcriptional study of 25 hepatoblastoma samples by RNA-seq. This work, published in Hepatology journal (https://aasldpubs.onlinelibrary.wiley.com/doi/full/10.1002/hep.29672) led to the design of a new 4-gene signature that can be used by pathologists for the stratification of tumors, the identification of a new oncogenic pathway (e.g. Fanoni Anemia pathway) and a novel treatment option using Velcade for patients with a C2A-type proliferative hepatoblastoma. 1 avenue Claude Vellefaux – 75010 Paris. The 20th of octobre in Tripoli (Liban), Pr. Aksam Merched, from MiRCaDe team, receive a trophy during the 24th Congress of Surgical Society of North Leabanon, from the organizing committee and his president for accepting their invitation and giving a lecture on immunotherapy of cancer in a special session dedicated to therapeutic innovations. The European Society for Pigment Cell Research (ESPCR) is a scientific society dedicated to understanding the biology of the pigment cells, melanocytes, from normal to pathological development. The 21th ESPCR Meeting will be hosted in Rennes, the capital of Brittany in France on 24 to 27 september 2018. It aims at deciphering the biology of the melanocyte and its ecosystem, the better to understand its dysfunction and pathological evolution. To this end, the 21th ESPCR Meeting will bring together competencies from basic science to disease. It will also be a unique opportunity to envision the forthcoming new therapeutic approaches. To promote science, the ESPCR meeting includes two keynote lectures, guest lectures from internationally recognized scientists, oral presentations from peer-reviewed abstracts, poster sessions and an Innovation pitches session. Social events are organized to promote networking and very importantly, the ESPCR sponsors several travel awards. 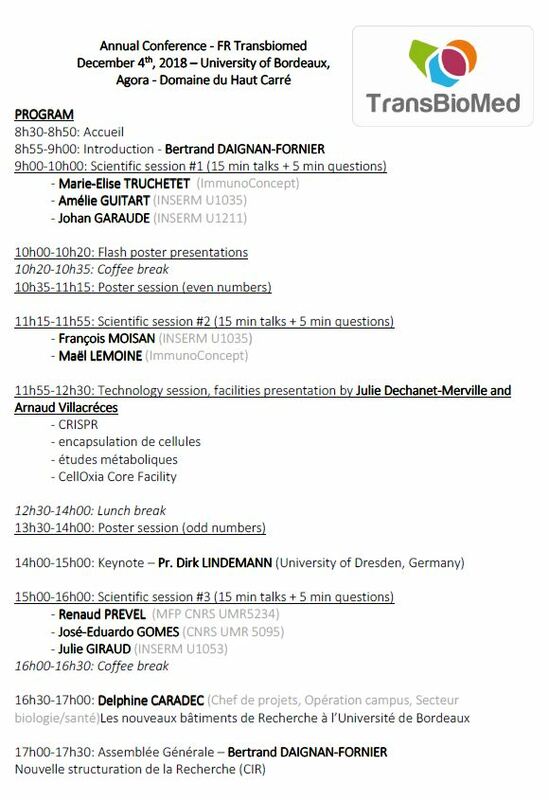 the second edition of BCBG will take place the 4th of April at the Domaine du Haut-carré (Talence) from 9 a.m to 5 p.m.
My research largely focuses on the molecular and cellular mechanisms underlying inherited non-syndromic and syndromic skin disease including keratodermas, ichthyoses and atopic eczema. In addition, this work has highlighted the importance of studying skin disease to understand non-cutaneous conditions such as oesophageal cancer, hearing loss and cardiomyopathy. I am Deputy Dean for Research of Barts and the London Medical School, and I am President-Elect of the European Society of Dermatological Research. I was awarded the 2016 CHANEL CERIES research award. Abstract : The ability of cells and tissues to withstand and respond to a variety of stressors is fundamental to life. In mammals, the skin plays a unique role in the defence against external damage, pathogens and allergens, and therefore displays many specialised adaptations to environmental stress. In particular, the epidermis of palmoplantar (palm and sole) regions is uniquely adapted to withstand remarkable physical stress. We have identified dominantly-inherited point mutations in the gene encoding iRhom2 (RHBDF2) associated with Tylosis with Oesophageal Cancer, a syndrome in which affected individuals develop focal palmoplantar keratoderma (PPK) and have a very high risk of oesophageal squamous cell carcinoma. We have shown these point mutations to result in gain-of-function of the iRhom2 protein, a catalytically inactive member of the rhomboid family. Based on multiple lines of evidence generated by our laboratory, this proposal hypothesises that iRhom2 functions as a major regulator of the response to cellular stress and disease in the epidermis. Our work has shown iRhom2 to be an important regulator of keratin dynamics, the epidermal barrier and growth factor / cytokine production via regulation of the sheddase ADAM17. This talk will discuss the role of iRhom2 in regulating epidermal keratin dynamics in response to stress and will describe signalling pathways both upstream and downstream of iRhom2. conference room at the Plateforme de Génomique Fonctionnelle, Carreire, University of Bordeaux. Chronic plaque-type psoriasis is a skin inflammatory disease driven by IL-17-producing Th17 cells. In addition to IL-17, Th17 cells in psoriasis produce other cytokines including interleukin (IL)-26, a member of IL-10 cytokine family. However, whether the production of IL-26 by Th17 cells plays a pathogenic role in psoriasis is unknown. By comparing IL-26 and IL-17 expression in psoriatic skin samples, we found that high IL-26 and low IL-17 were detected in acute forms of psoriasis, including erythrodermic and guttate-type, whereas low IL-26 and high IL-17 mainly associated with chronic plaque psoriasis. The dichotomy of IL-26 and IL-17 expression was confirmed in T cells infiltrating psoriatic skin lesions and circulating in the blood where IL-26 producing T cells and IL-17-producing T cells represented distinct cell populations within CXCR3– CCR4+ CCR6+ Th17 cells. Finally, we assessed the pathogenic role of IL-26 in psoriasis by using IL-26-transgenic mice. Skin injury of IL-26 transgenic mice triggered an inflammatory response and a skin phenotype resembling psoriasis, suggesting a pathogenic role in the induction of the disease. Together, our findings indicate that IL-26 is expressed by a distinct subset of Th17 cells in acute forms of psoriasis, where it may drive the inflammatory process and disease development. Scleroderma The 5th World Congress will be in Bordeaux from 15 to 18 February 2018. Antonin Marchais, invited by Christophe Grosset. Over the past few years, important new aspects of small RNA biogenesis, maturation, editing and circulation have been described. These sophisticated processes vary with biological context and produce small RNAs with a wide range of sequence and spatial distributions. Statistical analysis of these variations from deep-sequencing data enables to identify the triggering biological perturbations; even at long distance from the initiator tissue if applied to circulating small RNAs. In this scientific context, I will present our implementation of a versatile tool to detect and study phased biogenesis of viral derived siRNAs in mammals and endogenous siRNAs in Plants. Second half of the seminar will focus about our last work concerning new family of pseudogene derived siRNAs in Plants; their expression, tissue specificity and their probable role as translational repressor. 6 and 7 December 2016, PALAIS DES CONGRÈS. Bordeaux has been chosen to organize the 2019 edition of the European Society for Dermatological Research (ESDR). 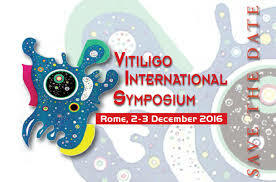 This annual congress gathers around 1000 investigative dermatologists and researchers, mostly from Europe, but a strong American and Asian participation is expected. Before Bordeaux, Munich (2016), Salzburg (2017), and Orlando (international Investigative Dermatology IID) will be hosting the meeting. The local organizing committee will start preparing this prestigious event very soon. The 46th Annual ESDR Meeting will be held at the Technical University campus in Garching, a short distance from the centre of Munich. The meeting has its own website at.